The eclipse we experienced May 20th is known as an annular eclipse, and it occurs when the moon is too far away to fully obscure the sun as it passes before it. This is in contrast to the more famous kind in which the moon completely covers up jolly old Sol, creating a total eclipse of the heart. No, wait, I mean sun; Bonnie Tyler’s song just kind of naturally slipped out, child of the 80’s that I am. 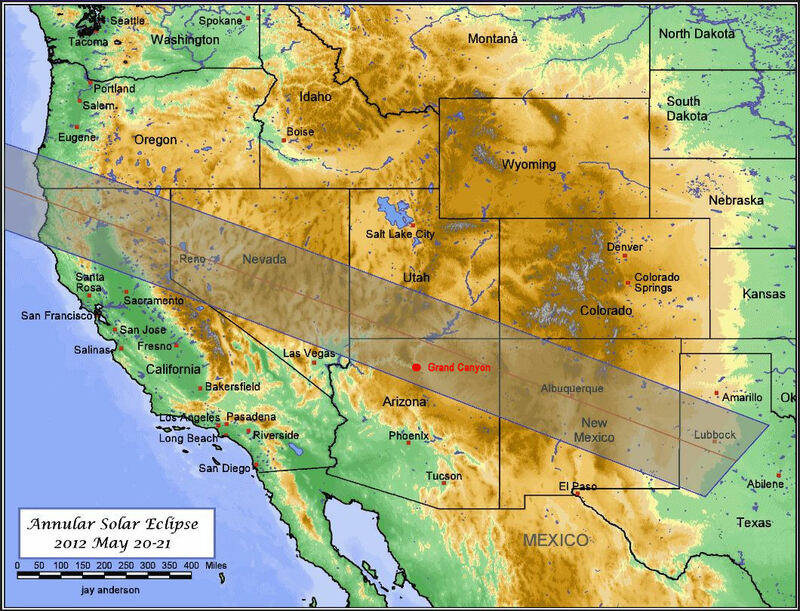 Annular eclipses are also known as ring of fire eclipses because at their peak the moon fits perfectly within the white-hot circle of the sun, like a nestled pair of measuring spoons, if you can get your mind around a bigger spoon made of boiling, burning hydrogen gas. 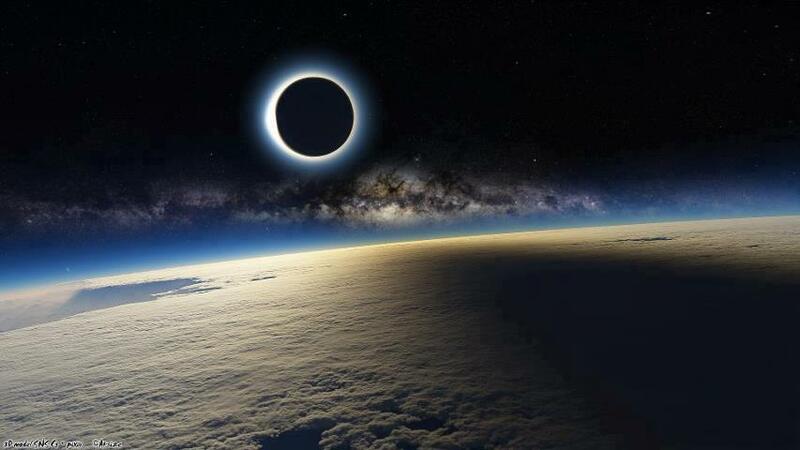 These kinds of eclipses don’t occur very often, unless you’re a redwood tree, or a Galapagos tortoise maybe, in which case you’re probably thinking, Another one of these? What’s it been? Twenty years? Seems like just yesterday. And why am I reading this person’s blog? The nice part is, by not divulging too much concerning the where’s and the why’s, it leaves open the possibility in the girl’s mind that she might be going someplace really great, giving you a certain amount of leverage over the incessant questioning. “If you don’t quit with the questions, we’ll just forget the whole thing,” works pretty well at forestalling what would otherwise be virtually non-stop verbal harassment. Overall, it’s a calculated risk, one which demands the utmost confidence, and a constant hyper-vigilance as to the location of your car keys to ensure that you don’t find yourself stranded by your family 180 miles from home; but in the end it almost always seems to be a chance worth taking. This photo was actually taken by someone in Phoenix. popping up all over the internet, including here. As far as withholding information of this sort from your family goes, the only other advice I can give here is that the longer you can hold out, the better off you’re likely to be, especially if it’s the kind of trip you are convinced will be fun, but which you are equally convinced they will not see similar potential in beforehand. For instance, prior to leaving, I only provided two pieces of information regarding our excursion: one, that we were going north, so that we all dressed appropriately for cooler weather; and two, that we would be back in time for work and school on Monday. Once we actually were on our way out of town, I released two additional tidbits in response to their reinvigorated questioning: we were going somewhere special to watch the sun set, and we were going to see something none of us had ever seen before. It was all completely true, but not very helpful, since none of them knew about the eclipse, and the destination theoretically included every northern point on the map within a ten-hour driving radius. If you put any effort into making the journey enjoyable, you might be surprised at what can qualify as a fun trip. We once set off one Sunday with the modest goal of finding a place to have a picnic lunch, and easily racked up a hundred miles driving from one end of the valley to the other in search of the perfect spot before finally deciding to spread our picnic blanket on the asphalt parking lot of the Cave Creek public library at four in the afternoon. 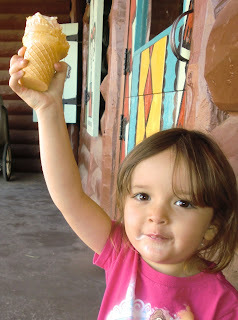 But we did all kinds of unexpected, fun things along the way, which made it a memorable trip. The key to this kind of travel is having a clear goal, while still maintaining both flexibility and a willingness to seize on the natural opportunities that will spontaneously present themselves. 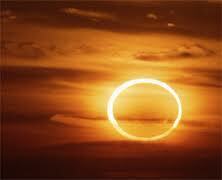 Still another photo of an annular eclipse. Still not taken by me. 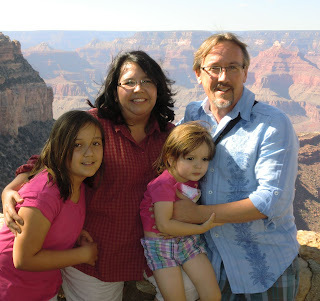 Elizabeth figured out where we were headed about twenty miles past Flagstaff, but we almost made it to the gates of the park before my ten-year-old daughter realized that we were going to the Grand Canyon. This was mostly because she was reading Harry Potter and the Goblet of Fire as we drove. Now, Harry Potter and the Goblet of Fire is one long-@$$ book, especially when you are reading every word of it aloud, which is what we’ve been doing, mostly me, reading to her a few pages at a time before bed. She read about fifty pages to us as we drove ever northward (including all the events surrounding the big Yule Ball, for those of you who simply must know), but even with this unexpected windfall, we’re still barely on pace to complete the series before she leaves for college. And it wasn’t until we had entered the park, and Elizabeth was perusing a packet of information handed to us by the ranger in exchange for our entrance fee, that the why was revealed. Before I could think to ask for them back, she noticed one of the flyers proudly announcing that the park was hosting a special eclipse viewing party today. It was an unanticipated setback, but I was able to make it to the parking lot before they could really begin to mount any organized campaign of resistance. A brief side note regarding parking. By chance, if you happen to be visiting a national park when it’s extremely busy, and the parking lots are obviously full, and you’re walking to your car with your family, and some poor sap sees you and begins to follow you to your car (at all times maintaining a respectful distance, of course) and claims dibs on your spot with his turn signal, and you then spend close to ten minutes rearranging and transferring stuff between the front and the back, without ever deigning to acknowledge the stranger meekly idling behind you, and then you get into your vehicle, apparently for the purpose not of leaving but of enjoying lunch with your family in the comfort of your car, could you at least consider giving the poor slob who misinterpreted your intentions some kind of indication, a simple shake of the head aimed in his direction perhaps, or a polite hand gesture, or a “Hey, bub, would you like a bite of my roast beef sandwich?”, anything instead of just pretending that the stranger and his family don’t exist? Do you not know how quickly a carload of females can form a mutiny? but it looks Photoshopped to me. It was only through the gracious courtesy of a second group of people whom we tailed to their car that we were fortunate enough to secure a parking spot. We entered the Grand Canyon Visitor’s Center around two in the afternoon. 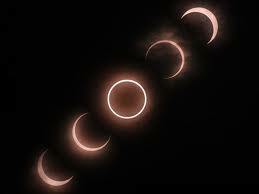 The eclipse itself was scheduled to start around 5:30, with the actual annular portion beginning at precisely 6:34 p.m. I had surreptitiously stowed away my spotting scope, tripod, and some stiff white paper so that we could observe the eclipse indirectly, but I hadn’t been able to find the special glasses, or even welder’s glass dark enough (apparently #14 or higher is required for observing eclipses), to be able to look straight at it. When I asked in the visitor’s center about the availability of special eclipse-viewing glasses, a very helpful, if slightly effeminate, ranger informed us that, at last report, there were still some for sale at the Verkamp’s Visitor Center at the west end of the park village. Two of my girls, fo' shizzle. Excited by this serendipitous possibility, but entirely unwilling to sacrifice our hard-won parking spot, we boarded one of the free shuttle buses that travel around the park, and rode it to the El Tovar/Bright Angel lodges area. 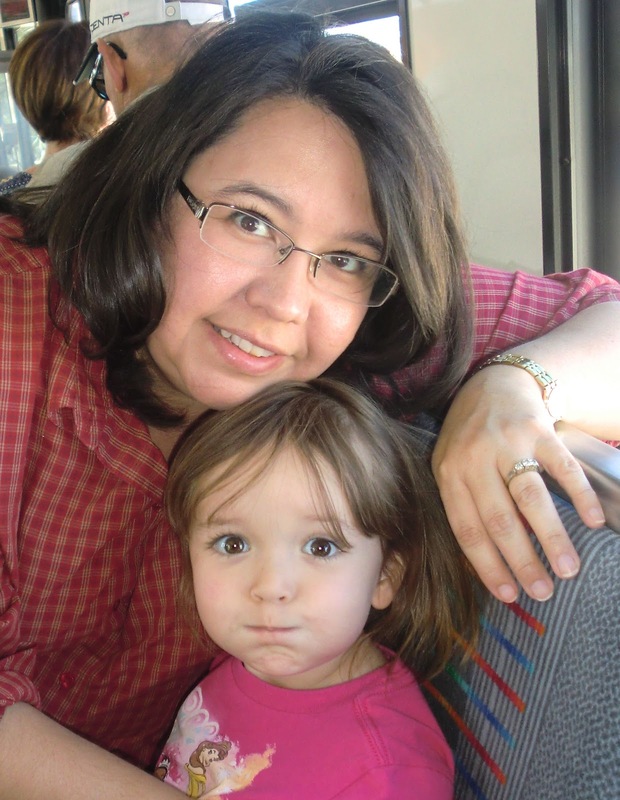 Our three-year-old thought the shuttle bus was the ultimate in high adventure. 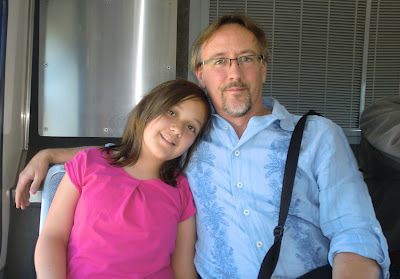 “Forget the mile-deep, 50 million-year-old rip in the earth outside, Dad, these buses are da’ bomb, fo’ shizzle,” she told me, in so many words. Unfortunately, the last of the eclipse glasses had been sold by the time we made it over, and so we left the other visitor’s center somewhat deflated. 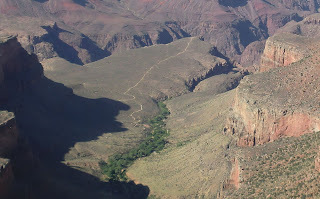 We spent a few minutes peering over the edge of the canyon, identifying where the Bright Angel trail zig-zags down the canyon wall and then, at what must be a thousand feet below (note: I just double-checked and it’s actually three thousand), marches across a broad plateau before disappearing over its far side. 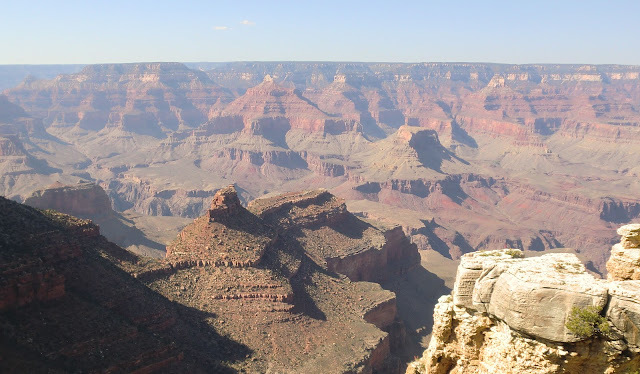 It gives the uncomfortable impression of appearing to plunge blindly over the edge into the empty depths of the lower canyon, and certain death. The specter of death reminds me of the one time I hiked this canyon, me and two friends, all of us high school seniors, to the bottom and back in one day, except we took the South Kaibab trail. But that’s a story for another time. 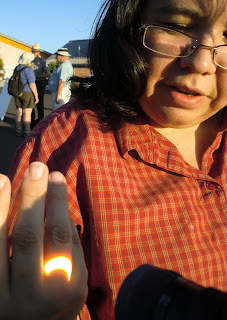 The sun, whose view of us was not yet being impinged by the moon, was ferociously hot. We sought to curb its potency with the only remedy available to us: ice cream, which, as far as remedies go, worked pretty well, and perked our flagging spirits up to boot. Then we piled back on the shuttle bus, which whisked us back to the location of the viewing party. Well, whisked is a little misleading. Plodded and staggered like a runt mule carrying Cee Lo Green down to the bottom of the canyon is closer to the mark. The quick, ten-minute trip to get there became a forty-minute trip to get back. It seemed like the driver was inventing new stops, just to see if he could break the standing record for number of humans packed into a standard size tour bus. “Move back, people. I got a couple more I gotta squeeze in here behind the white line,” was the refrain repeated by the loudspeaker, met each time by helpless expressions and several small moans from the people being compacted even more in the center aisle. Maria was on my lap, but was constantly trying to slide off, a fun game for her, but one which placed a wrenching torque on my back as I lifted her repeatedly back into my lap. The Indian woman next to me had a young boy on her lap, too; putting three humans in direct violation of my personal space. I caught myself resisting the urge to slip into a “This too shall pass,” zen-like state as a response to the cramped, trapped, stifling conditions, focusing instead upon staying alert so that Maria didn’t slip down my legs and disappear forever under the seat in front of us. 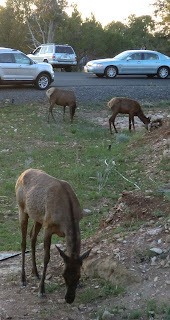 On the plus side, though, we did see seven or eight elk casually foraging around the edges of the road as we finally began to loop back around to the familiar clutch of buildings marking the end of the ride. However, by that point, my arms were firmly pinned to my sides, and after a few futile finger-wiggles, I had to abandon any attempt to draw the camera out from the pocket of my cargo shorts. We arrived back with just enough time to grab our stuff from the truck and make our way to the area reserved for the big, park-sponsored, eclipse viewing party. 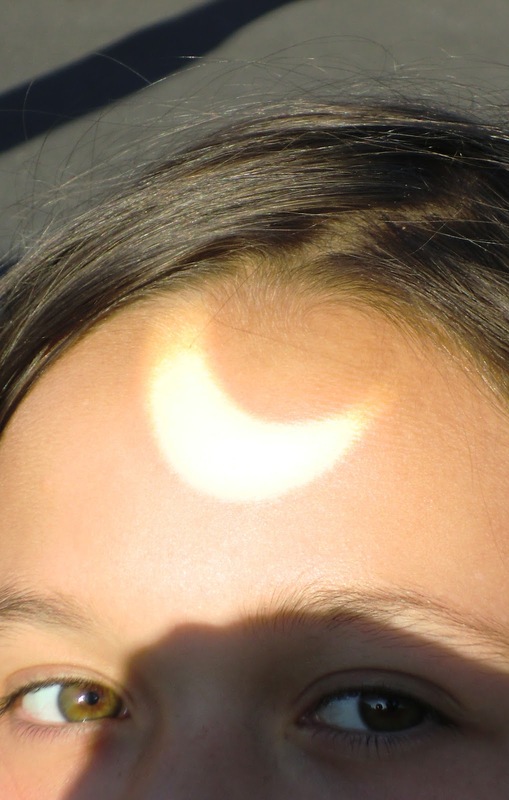 Astronomy groups had set up their big scopes in a blocked off section of a parking lot, and spectators were lined up to take a look at the sun, which we could see from one of the projecting scopes was already missing a rounded, perfectly-scribed moonbite. Park rangers monitored the crowd from the perimeter. We found out that the rangers had been passing out free glasses for watching the eclipse, and had run out only a few minutes before. 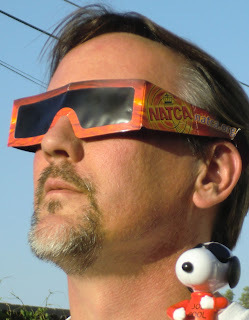 Ultimately, though, our lack of eclipse glasses wasn’t a problem at all. I had my scope, which I set up in a matter of a few minutes, and some nice people from Florida allowed us to borrow a pair of their glasses whenever we pleased. A man with an expensive camera rig and a solar filter generously let us look, and even use the filter to take a few pictures. 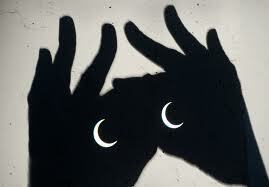 That’s the nice thing about the eclipse crowd; everyone was pretty mellow, and willing to share. It was, dare I say, almost a socialist experience. We reciprocated by passing around Elizabeth’s killer chocolate chip cookies, and, judging by the looks on people’s faces, they clearly felt they had gotten the better end of the deal. kept slipping, and then it was too late. 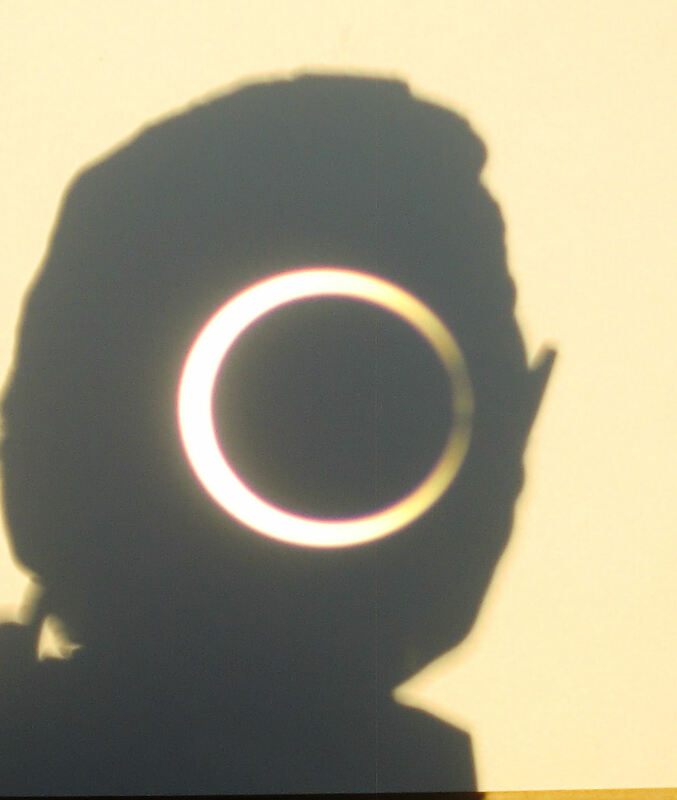 As the moment of complete annularity approached, the crowd hushed in anticipation, and when the moon finally detached itself from the inner wall of the sun and floated free like a black bubble inside the radiant ring of the sun’s light, spontaneous but subdued, almost reverent, applause broke out. 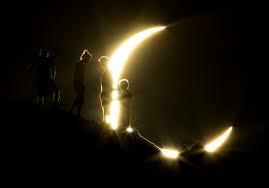 That’s when I realized: I love eclipse people. 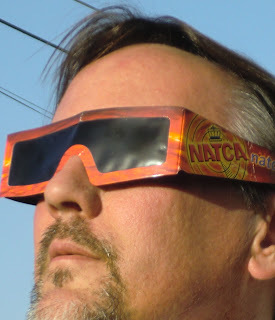 For a few fleeting minutes we all watched the ring of fire by whatever means we had available: filtered scopes and cameras, special eclipse glasses, or cards with a rectangle of special cellophane-like plastic in them, or images projected through unfiltered scopes like mine. I admit, I even took a quick, unfocused – and of course ill-advised – peek through eyes barely cracked open, and further filtered by two rows of eyelashes, and was amazed by how powerfully intense the sun is, even when something like 94% of it is covered up. ...and eclipsed sunlight. Kind of eerie, isn't it? All too soon, the moon grazed the opposite edge of the sun’s disc and then began pushing through it, maintaining its purely mechanical, celestial movement. The crowd quickly began to lose in interest in the waning of the eclipse, the same crowd who had been so enthralled by the build-up and climax. Who would’ve figured, I thought to myself as they began to steadily flow by in the direction of the visitors center, that eclipse people would turn out to be fickle? We hung around while the crowd thinned, taking pictures and chatting with the people from Florida. They invited us to come visit them at their home, emphatically underlining the utter generosity of eclipse people. I began to pack up the scope when I remembered that I had wanted to get some pictures of shadows, because of the way they turn into tiny images of the eclipse itself, which I was always fascinated by. I had wondered what the shadows during the peak of an annular eclipse would look like. Would they appear to be dark circles with a ring of light around them? Of course it was too late by then to see the answer for myself. 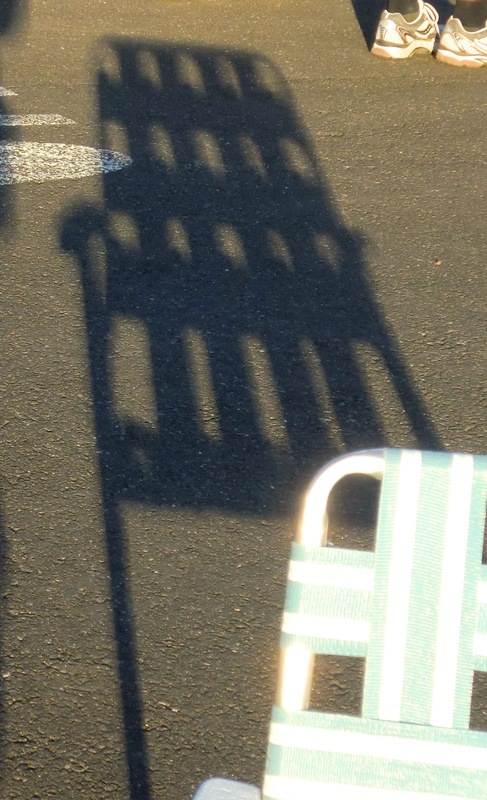 Even so, I took pictures of the shadows cast by the partially eclipsed sun through the webbing of one of the lawn chairs we brought with us. By that point, though, you could barely tell a difference at all. Rats. Incidentally, you may have noticed that the title of this piece is Rings of Fire, plural, implying that there is more than one ring of fire to be found in this post. If you are someone who thought this, give yourself a prize. and in the darkness bind them..."
Oh, and since we were at the Grand Canyon and all, I suppose I should include a few of the obligatory snapshots of our visit to the big ditch. 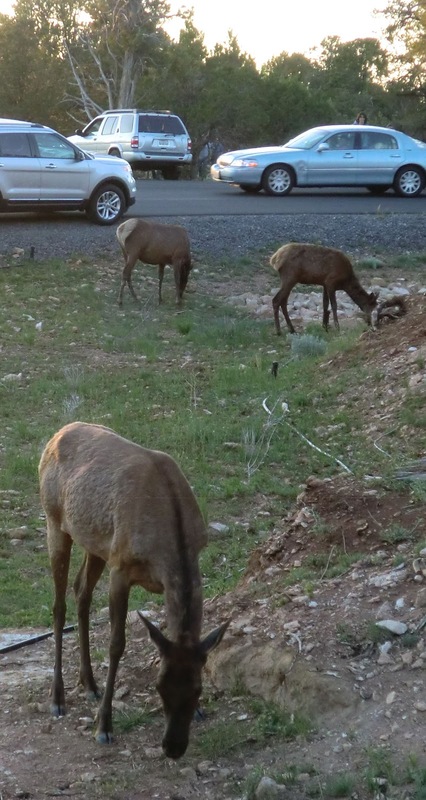 And we did see some more elk as we were leaving the park. glasses like this are in darkened theaters. They truly are the ultimate fashion accessory. Jessica looks awesome with the moon on her forehead! Great pics! 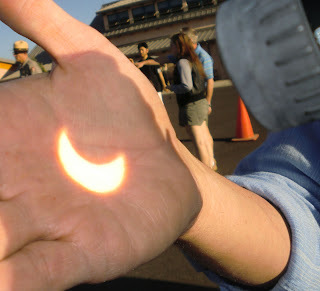 I had to view it without any special technology- poked a hole in a piece of paper and looked at the shadow it created.